Sorry Wiesje (en anderen die onpasselijk worden van de antisemitische cartoons die we hier wel eens hebben getoond), maar je moet dit zien voordat je het gelooft, in ieder geval vergaat het mij vaak zo. De 3 walgelijkste cartoons, met kinderen en concentratiekampen, hebben we wel vervangen door een linkje. Het komt erop neer dat de Guardian, een zogenaamde kwaliteitskrant, een cartoon heeft afgedrukt van een notoire antisemiet die niet had misstaan in Der Sturmer. Je kunt je afvragen wat dat zegt over de motieven van deze krant om de Palestine Papers uit te brengen. De commentaren die men erbij plaatst laten in ieder geval zien dat een van de motieven is om Israel zo zwart mogelijk af te kunnen schilderen, maar mogelijk wil men ook een Palestijns leiderschap in discrediet brengen dat bekend staat als relatief gematigd en dat blijkt daadwerkelijk bereid te zijn geweest tot het sluiten van een compromis? 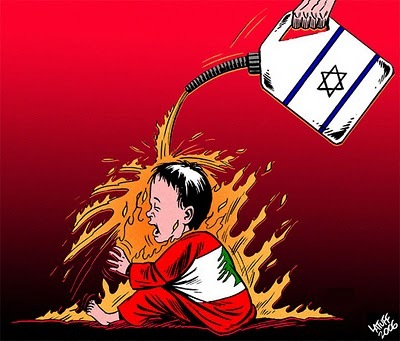 As I noted previously (in a piece for the JCPA, as well as a guest post for Elder of Ziyon), Latuff is a Brazilian political "activist" and cartoonist with an impressively large portfolio of work  much of which openly express anti-Semitic themes. 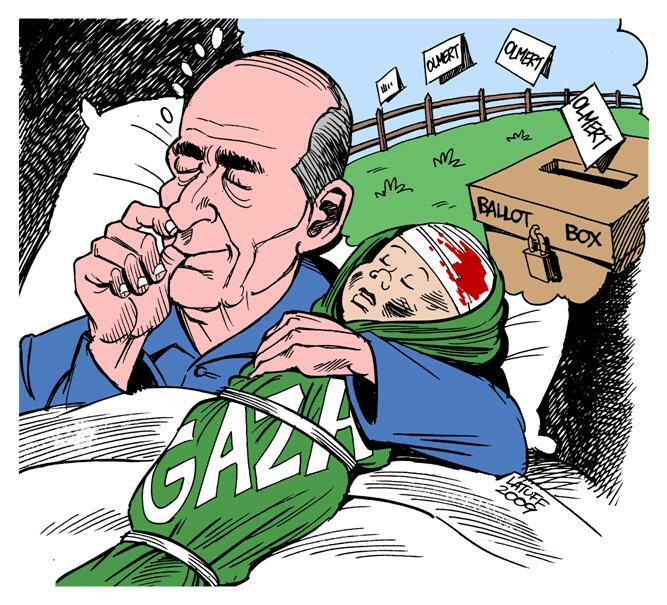 Some of his caricatures seem to suggest that Israel is a unique and immutable evil in the world. His work includes imagery frequently suggesting a moral equivalence between Israel and Nazi Germany  and he has explicitly acknowledged that this indeed his political view. 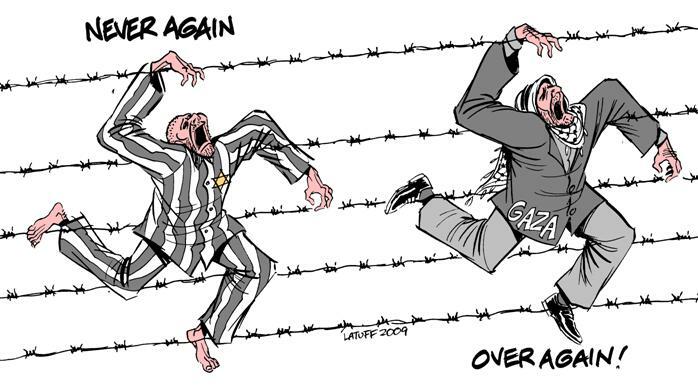 Latuff's notoriety includes his participation in the 2006 Iranian International Holocaust Cartoon Competition  for his cartoon comparing the Israeli West Bank security barrier with the Nazi concentration camps. Latuff placed second in the contest. In their 2003 Annual Report, the Stephen Roth Institute compared Latuff's cartoons of Ariel Sharon to the antisemitic caricatures of Philipp Rupprecht in Julius Streicher's Der Stürmer. Even the Guardian's Ian Black noted that Latuff was among those cartoonists "drawing, without inhibition, on judeophobic stereotypes in the service of the anti-globalisation movement." 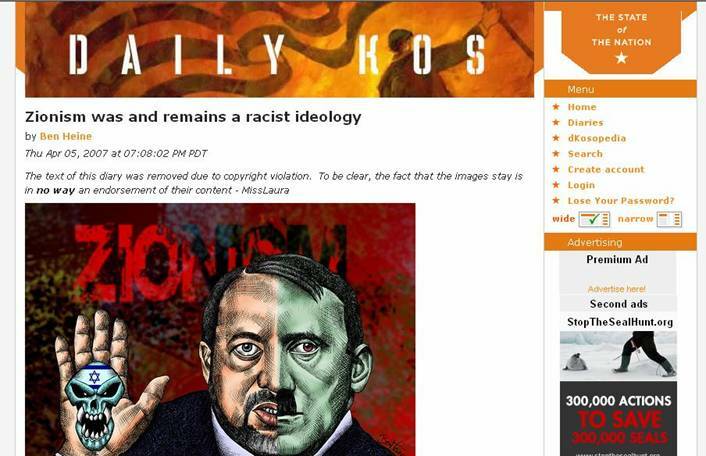 This cartoon, comparing Zionism to the Ku Klux Klan, made reference to an anti-Semitic cartoon by James Heine, which was posted at the blog, Daily Kos, but subsequently removed by editors of the site. 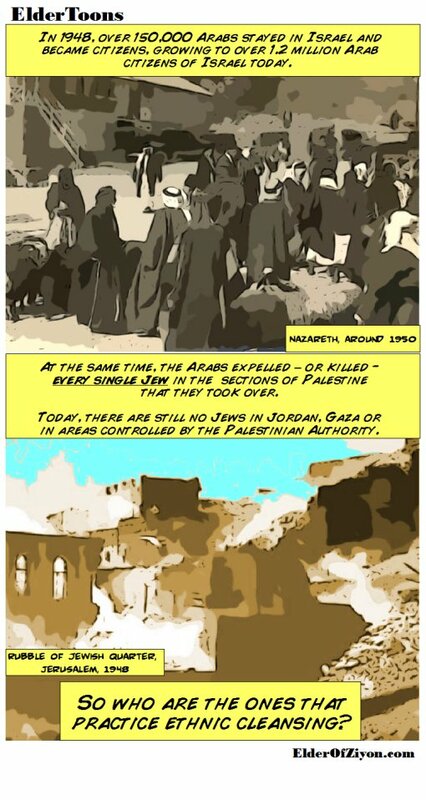 Their decision to employ the services of an extremist such as Latuff is a reminder that the most important story pertaining to the "Palestine Papers" is not the contents of the documents as much as it is the lengths the Guardian is willing to go in service of their viscous anti-Zionist agenda. Palestijnse leiders ontkennen niet alleen de concessies die ze volgens de Palestine Papers zouden hebben gedaan, maar zeggen ook dat er sowieso een referendum zou komen. Bovendien hadden de Palestijnen niet met alle ideeën die werden bediscussieerd tijdens de onderhandelingen ingestemd, zo benadrukt Saeb Erekat. Juist. Zoals gezegd, je bespreekt van alles, laat balletjes op, test hoe de ander op bepaalde ideeën of suggesties reageert etc. Elder of Ziyon wijst er op dat terwijl de Palestijnse leiders vaak tegenstrijdige dingen zeggen en nu weer ontkennen waar ze eerder toe bereid waren, Israel een stuk consistenter is. Het is duidelijk dat Israel bereid is tot een compromis: Netanjahoe zegt openlijk dat men niet over de Westoever en de Palestijnen kan blijven heersen, en dat er 'pijnlijke concessies' moeten worden gedaan, zoals Olmert en Sharon dat voor hem zeiden. Dat is niet helemaal waar: wat betreft Jeruzalem bijvoorbeeld is er ook vaak onduidelijkheid. Als men realistisch is, weet men dat de Palestijnen (en de Arabische wereld) er nooit mee in zullen stemmen dat Israel heel Jeruzalem met alle buitenwijken houdt. Maar Netanjahoe zal dat niet openlijk zeggen. Er is echter ontegenzeggelijk veel meer openheid en realiteitszin aan Israelische zijde, en meer debat. Zolang de Palestijnse straat zo woedend reageert op een enigzins realistisch compromis zijn de kansen op vrede nihil, en daarom vraag ik mij af hoe serieus de Palestijnse leiders werkelijk waren: als men werkelijk een dergelijk compromis uit wilde voeren, dan zou men toch de Palestijnse bevolking langzaamaan aan het idee moeten laten wennen dat er een compromis zal moeten worden gesloten, dat de Joden zullen blijven en niet zullen accepteren een minderheid in eigen land te worden, en dat het beter is voor een half ei dan een lege dop te gaan. Kortom: het tegendeel van wat de Palestijnse media nu dagelijks verkondigen. The divergence between how the Guardian is spinning the Palestine Papers release and how the actual leaders of the Palestinian Arabs are reacting teaches us volumes. In the past few hours, a number of reports have surfaced regarding our positions in our negotiations with Israel, many of which have misrepresented our positions, taking statements and facts out of context. Other allegations circulated in the media have been patently false. But any accurate representation of our positions will show that we have consistently stood by our people's basic rights and international legal principles. Indeed, our position has been the same for the past 19 years of negotiations: We seek to establish a sovereign and independent Palestinian state along the 1967 borders with East Jerusalem as its capital and to reach a just solution to the refugee issue based on their international legal rights, including those set out in UNGA 194. Even though many ideas have been discussed by the two sides as part of the normal negotiations process, including some we could never agree to, we have consistently said any proposed agreement would have to gain popular support through a national referendum. No agreement will be signed without the approval of the Palestinian people. And Mahmoud Abbas is even saying that any hint of flexibility in the leaked documents actually reflect Israeli positions, not PalArab positions! We did not agree to any proposal regarding east Jerusalem. The only position to which we adhere is Abbas' position that east Jerusalem, according to the 67 borders, belongs to us. So we are left with two possibilities. Either the Palestinian Arabs were the flexible parties and Israel the intransigent ones, which means that Abbas, Abed Rabbo and Erekat are lying now, or Israel was always the more flexible party and the Guardian is lying now. We also see from the Guardian's screed that the newspaper is not interested in a real peace, but in forcing Israel to make all the concessions and rewarding the Palestinian Arabs for their decades of terror and refusal to accept Israel as a reality. Of course, while some details about what Tzipi Livni offered might raise an eyebrow or two, everything Israel has said about the negotiations has been very consistent through the years, and consistent with what the leaks say. The Israeli leadership has repeated the mantra often enough: "We will have to make painful compromises for peace." Those words about compromise were never uttered by any Palestinian Arab leader or negotiator, because the entire idea of compromise is foreign to them. Especially when they have cheerleaders like the Guardian ready to support their intransigence (and insult the very idea of compromise.) Behind closed doors, perhaps, they float an idea or two, but they can rest assured that their people who they themselves have indoctrinated to hate will reject any plans they pretended to accept to make the US happy. Israel's position towards compromise has been vindicated. The Abbas regime's intransigence has been verified. And the only side that has nothing to hide is Israel. Not that the Guardian would ever admit that.